Any collector following the new G.I. Joe line will salivate knowing that wave 9 has just been released at retail (this of course will soon be replaced by salivating for wave 10 due out in the next couple of weeks). In the case assortment that includes some of the best sculpts and more interesting/colorful characters (Barbecue, Snow Serpent and B.A.T., anyone? 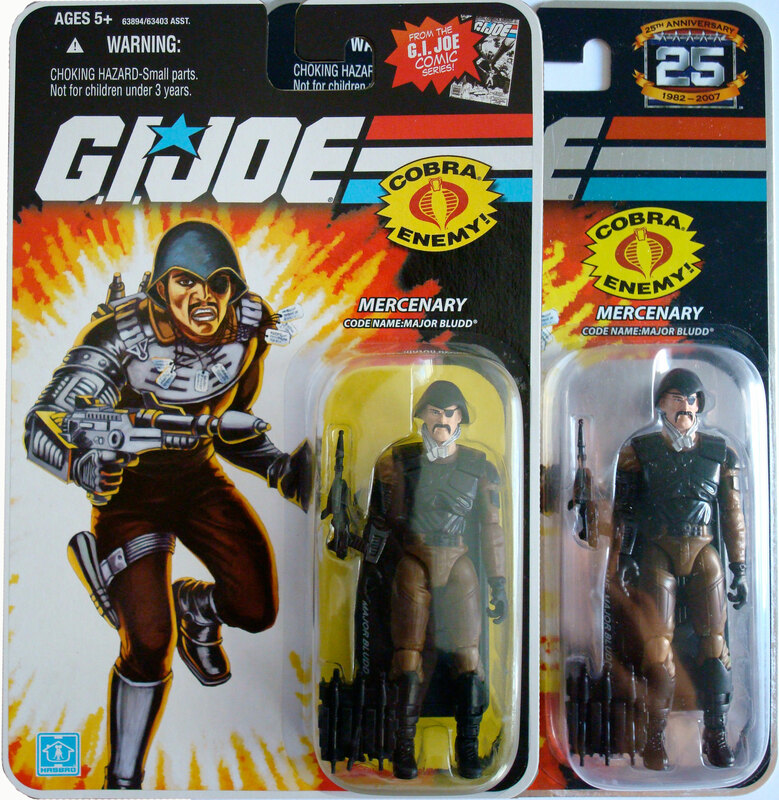 ), one will find the re-issue of two figures that were difficult to find the first time around: Major Bludd and Sgt. Flash. While it’s cool that these guys are being re-released for those who weren’t able to find them before, there’s another reason for those who already have the figures to plunk $7.99 down for another copy. Or another reason to drive completists absolutely bug-nuts. The original release came under the 25th Anniversary logo, but now that the year has passed, a new emblem has replaced the 25th emblem in the upper right-hand corner of the card. These new emblems change depending on the source of the character — either sourced from the tv show, a sub-line faction (such as Tiger Force), or the comic among others. 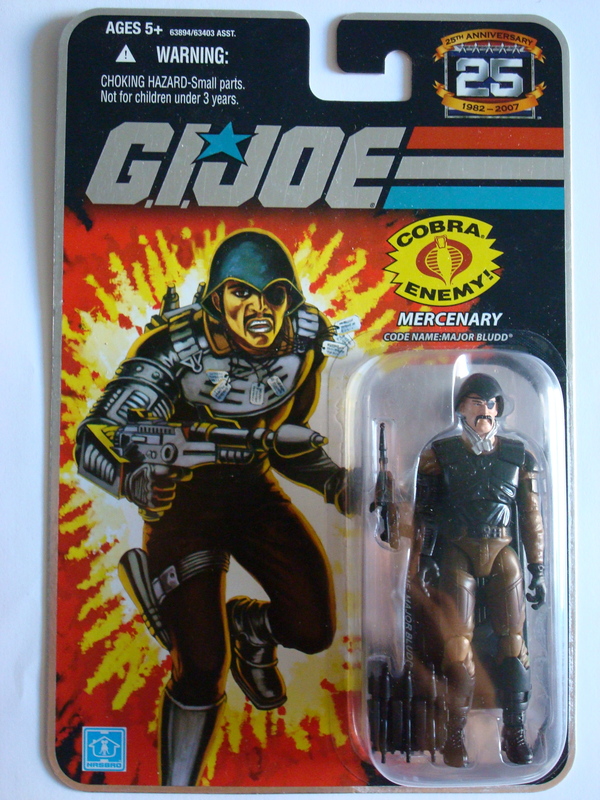 Other minor differences include a lack of foil packaging, a different explosion on the background of the character art, and a new placement of the “Cobra Enemy” logo. 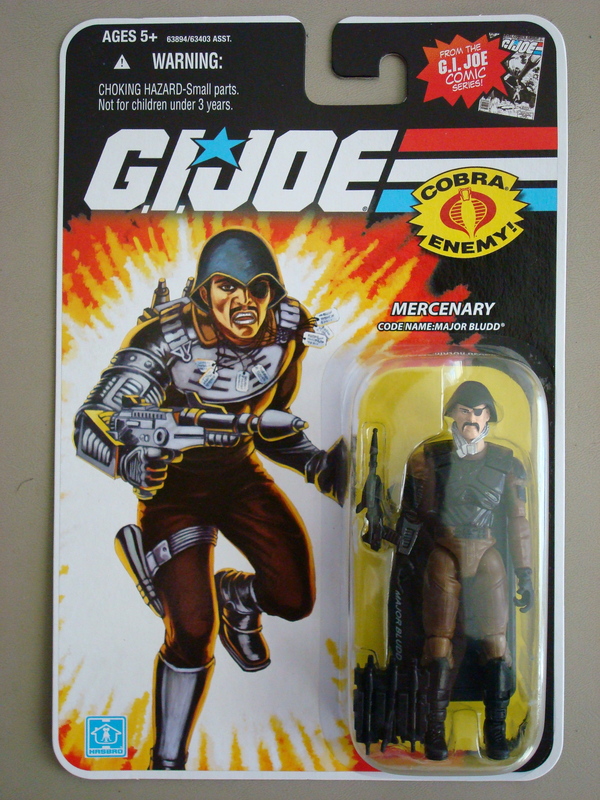 Being the kind of collector who usually buys one to keep MOC and one to open, I’m glad to finally get a Major Bludd that I can pull out of the packaging and set up on my shelf to collect dust. Yeah, nerdy, maybe sad, but I think it’s cool nevertheless.